Our mom had gone to college, then went into the Navy during WWII, returning with an offer to enroll in Stanford’s Business School. They were recruiting women at the time, she always said, and 2 years later she found herself a graduate of the first class to include women (there were 2 and mom was one of them; it was 1949). After finishing her MBA, she earned enough money to make her first purchase… a beautiful Mason & Hamlin baby-grand. 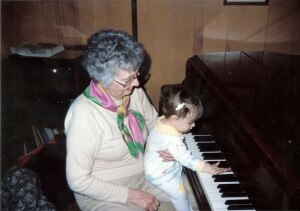 She played for years before arthritis took its toll on her fingers. I enjoyed my piano lessons as a child/teen…until boys driving became a powerful diversion from daily practice and the piano was quiet once again. In later years, she loved it when family would visit and play. One of Mom’s wishes was that the piano go to a family member, and she wanted to know where it would sit ready for someone to play after she was gone. I hope you enjoy these pictures of our family piano. The first picture is my Mom (Grandma Billy) with my niece a few years ago (she’s 23 now)! 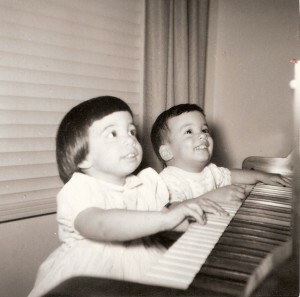 The second picture, at the same piano, is yours truly, a few years earlier with twin brother. We found a San Francisco Bay Area piano moving company that works all over the Bay Area. The move will be from Marin County to the Half Moon Bay Coastside area. I found the linked article below that could help all of us looking to move a piano– whether you’re searching for a new home or just a new place for a piano. Try to avoid putting the piano against an exterior wall. If you have to compromise, start at the bottom of this list – according to this article.